I've mentioned several times that I have degrees in Criminal Justice and Psychology, but I don't think I've ever specifically written about my love of true crime. I live on Investigation Discovery and have read more than my fair share of true crime novels. When I saw Supernatural Serial Killers on Netgalley, I literally let out a whoop of delight, which was repeated when my request was granted the other day. Seeing as I was currently between books, I decided now was the time to jump into this one. Once we are past those chapters (and into the 19th and 20th Centuries), I really enjoyed (hmm, I feel like that is not the right word for what I felt because that makes me seem morbid in the extreme) reading about crimes that we know without a shred of doubt were committed by the men convicted of them. 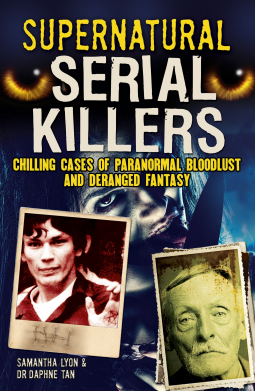 The most interesting studies were those on Albert Fish, Fritz Haarmann, and Jeffery Dahmer, but those (with the exception of Haarman) were crimes I was more familiar with than some of the others, many of whom I had no knowledge of prior to reading this book. One of the things that intrigued me was Lyon and Tan's attempt at categorizing the murderers, using the Holmes and DeBurger Typology (1998), which breaks down serial killers into distinct categories (Visionary-Type: killers who claim to have auditory or visual hallucinations and that those hallucinations led them to kill, Mission-Type: killers who are on a mission to rid the world of specific groups of people, The Hedonistic-Type: Killers who kill solely because it brings them pleasure--further broken down into Lust, Thrill, Comfort, and Profit sub-categories--and Power/Control Killers: those that kill in order to gain a sense of control). This is interesting because many books such as this one simply regurgitate the facts of the crimes and don't attempt to make any form of analysis. This is not a story book--it is an examination and analysis of facts, which I liked. It would have been much easier, especially since this book was obviously written for the masses and not the academic crowd, for them to simply list the nefarious deeds and point out the reasons why these murderers were given their respective monikers. I also liked that each chapter is separated into four sections--Introduction, Crimes, Trial and Sentencing, and Discussion. This kept things neat and reminded me of all those APA and MLA style papers I read (and wrote) in college and grad school. While the Discussion section is the shortest, this is the part that most appealed to me because it contained the analysis of the crimes committed and the person who committed them. This is probably because of all those psych classed that were required to get my degree. I do feel the need to point out that gore is definitely an issue in the book. Many of the crimes, especially the ones committed by Haarmann and Dahmer, are graphic and described as such. There really is no way for a discussion of these murders not to be graphic. If you're squeamish, this is not the book for you.